All Resort Luxury Sleep Mattresses use 100% CertiPUR-US certified foams. Perfectly designed and crafted to create an enveloping feel and look that appeals to every body. We targeted the most popular comfort. Our gel memory foam is medium firm - which means it is not too soft and not too firm. Trouble Finding the Right GELMemory Foam Mattress? Having trouble finding the best GEL memory foam mattress with the Just Right Feel, Support and Price? Need Free Shipping, Medium Firm comfort and CertiPUR-US Certified? Resort Sleep mattresses are available in Twin, Twin XL, Full, Queen, King or Cal King sizes. 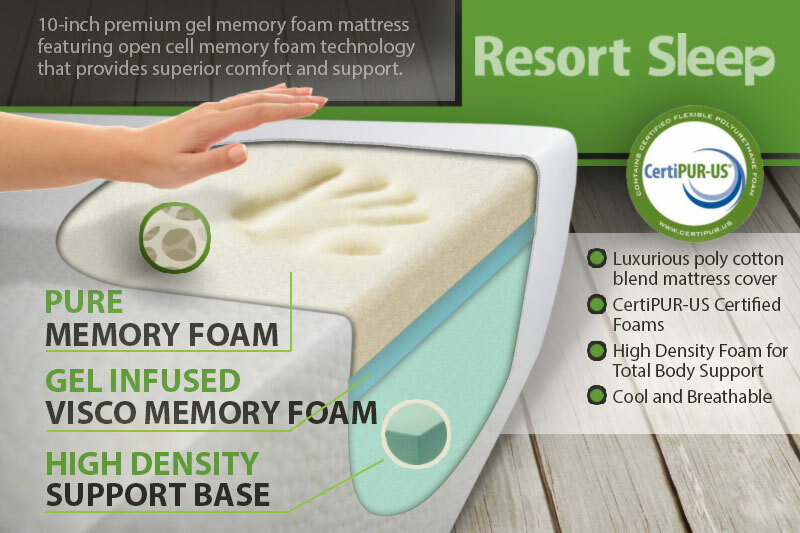 Resort Sleep gel memory foam mattress will give you a better night sleep. Designed with you in mind, for a great night sleep and not for huge retail markups. The Resort Sleep Mattress perfectly hits the ideal consumer preferred feel of medium firm. Years and years of analysis went into finding the most preferred feel and that is what the Resort Sleep gel memory foam mattress features. Designed perfectly from the inside out to give you the comfort, support, and the most popular feel. Sleep better and live better with the right gel memory foam mattress. The cooling comfort and total body support Resort Sleep mattress feels as good as it looks. At Resort Sleep we make sure all of our components are the best possible quality to give you the best sleep. That also includes the peace of mind that we’re using CertiPUR-US® certified components. Resort Sleep mattresses allow you to fall asleep with the right comfort and awaken refreshed from the right body support. Copyright 2019 Resort Sleep | All Rights Reserved.